For other uses, see Escape artist (disambiguation). 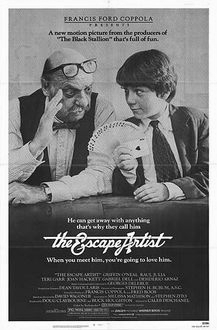 The Escape Artist is a 1982 film starring Griffin O'Neal and Raúl Juliá. It was based on a book by David Wagoner, and was the directorial debut of Caleb Deschanel. It was the final film of both Joan Hackett and Desi Arnaz. Young and self-confident Danny Masters is the teen-aged son of the late Harry Masters, the "greatest escape artist except for Houdini". Danny himself is an accomplished magician and escape artist. He leaves home to join Uncle Burke and Aunt Sibyl in their magic/mentalist act; Sibyl welcomes him, but Burke is unenthusiastic. Danny soon finds himself embroiled with Stu Quiñones,corrupt son of Mayor Leon Quiñones. The quest for a missing wallet (pick-pocketed by Danny) leads to the comeuppance of the crooked mayor, and separately of his vindictive and out-of-control son. Along the way, Danny comes to terms with the death of his father, the circumstances of which he did not previously know. The cast includes two members of the 1930s troupe the Dead End Kids: Gabriel Dell and Huntz Hall. The film received fair reviews from fans and critics alike. With a 62% audience rating from review aggregator site Rotten Tomatoes and a 6.2/10 on IMDb. This article about an independent drama film is a stub. You can help Wikipedia by expanding it. This page was last edited on 7 December 2018, at 21:53 (UTC).